"Here, dear readers, are practical, logical hives [Palteau, Du Couédic]. They are not perfect, but their faults are minimal. Eminent beekeepers such as de Layens, Abbé Voirnot and Abbé Sagot, would have made light of eliminating them. If these masters had only had to perfect our old French hives, instead of fighting the Dadant Hive, it is likely that I would have found the People's Hive as it is in its present form. I would have saved 20 years of research, work and expense. For, if, in fact the People's Hive came out of those of Layens and Voirnot, it is no less true that the People's Hive has the same principles as the Decouédic (sic) and Palteau hives." The dimensions given for the hive parts are in pieds, pouces and lignes. It is assumed that the pied du Roi was used, which equates to 32.483 cm. There are 12 pouces in a pied and 12 lignes in a pouce. The basic hive-body box is 325 mm square and 81 mm high. 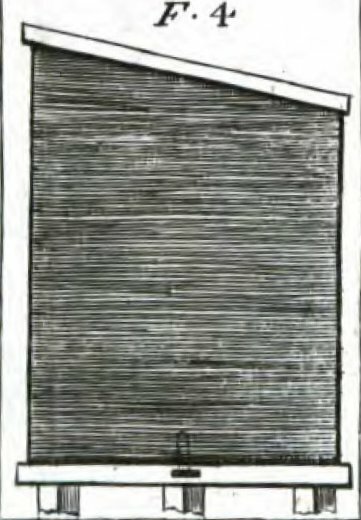 The box walls are 13.5 mm thick (plate 3, fig. 8). This makes the internal dimensions 298 x 298 mm, very close to Warré's 300 x 300 mm. Each box has an entrance in the bottom edge 27 mm high, 34 mm wide at the top and 25 mm wide at the bottom. Only the bottom entrance of a stack of boxes is left open. 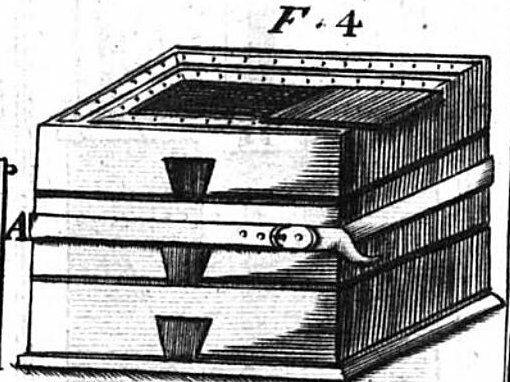 Above: 3-box Palteau hive, plate 2, figure 4, including strap (A) used when moving hives. Each box has a 'bottom' 7 mm thick with a hole 202 mm square in the middle and the remainder punctured by small holes (see illustration below). The boxes are inverted when on the hive. The large hole has a wooden cover (illustrated) that is inserted only in the top box and the small holes are covered with 4 strips of wood. A prime swarm is introduced into a hive comprising 3 or 4 boxes. Above: Palteau hive, plate 4, figure 3 (left), showing the 202 mm square hole and the perforated board. The cross illustrates the iron wire that binds the boxes together and passes through fasteners on the 4 sides of each box. (Right, plate 4, figure 4): The top of the hive with the holes covered by pieces of wood secured by wedges under the wire. Above: Palteau hive, plate 3, figure 1, four hive body boxes on the stand (image incompletely scanned by Google books). The stand comprises a platform 414 mm wide by 522 mm deep (front to back) and 40.5 mm thick supported on three stakes 730 mm long driven into the ground to give a surface height of about 350 mm. In the middle of the platform is an elevated area 365 mm square and 13.5 mm high. The hive stands on this and is to protect the bees from any moisture gathering on the margins of the platform. The platform has a 216 mm square hole in its centre closed with a drawer underneath and accessible from the back. This is used for warming the bees with a heater and for feeding. Debris collecting on the drawer can easily be removed. The hive is covered by a 'surtout', an 'overcoat' or cover, 648 mm high at the front and 540 mm high at the back to give a sloping roof (see below). Above: Palteau hive, plate 1, figures 2 & 4, showing the front (left) and side (right) views of the hive on its stand with its cover in place. It is in the harvesting of the honey crop that Warré sees the main disadvantage of the Palteau hive2. Palteau's method is first to remove the strips and sheet of wood covering the holes in the top box, the square piece being removed by running a steel wire under it. Then the bees in the top box are smoked down before slightly prising up the box with the hive tool and inserting wedges under each corner. Then a steel wire is used to cut through the comb between the boxes with a sawing action. As the boxes communicate with each other by a 202 mm square hole in each, the comb will very likely continue unbroken from box to box, hence the need to cut it. Warré argues that this action risks killing the queen and crushing bees, thus exciting the rest and leaking honey. 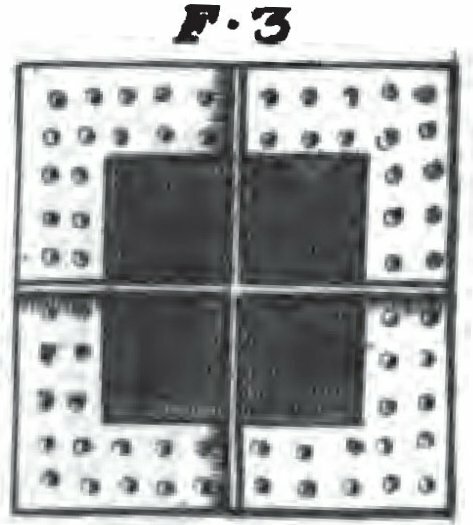 Palteau writes that as the only the top honey boxes, maximum two, are removed, and the queen, brood and centre of the colony is in the middle or at the bottom of the hive, there is no risk to the queen. If two boxes are taken, this equates to a 162 mm depth of comb, whereas one Warré box has a 194 mm (approx.) depth of comb. The method of harvesting the Palteau is identical to that still used to harvest from Apis cerana hives in Japan3. 2. 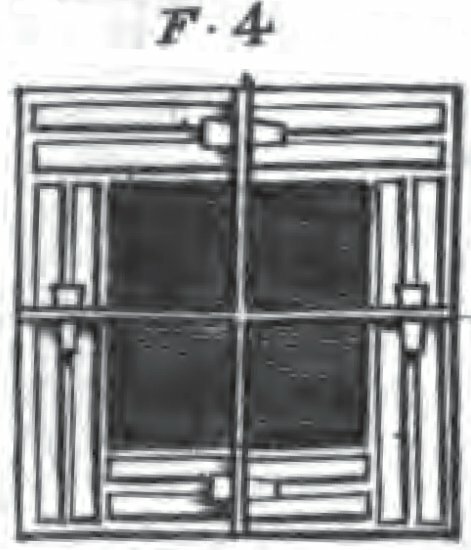 Abbé Émile Warré, Beekeeping For All, page 146.